The CPBL have issued a three-game suspension and a $1,600 fine to the Fubon Guardians’ manager 陳連宏 (Chen Lien-Hung). The newly appointed Guardians’ skipper was suspended and fined on the grounds of headbutting and chest bumping the umpire during a strike zone dispute on August 11, 2018. It was Saturday night, the top of the sixth inning. The Guardians’ reliever 郭泓志 (Kuo Hong-Chih) threw a breaking pitch that sliced through the bottom outside corner of the strike zone. The umpire, however, thought otherwise. For a little background on this, the umpire 江春緯 (Chiang Chun-Wei) is best known for his inconsistent strike zone. Before the whole incident started, there were more than ten questionable calls relating to the strike zone during the game. Seeing his pitcher is about to get into a full confrontation with the umpire, the Guardians’ manager decided to step in and protect his pitcher. The situation pretty much escalated to the next level immediately. 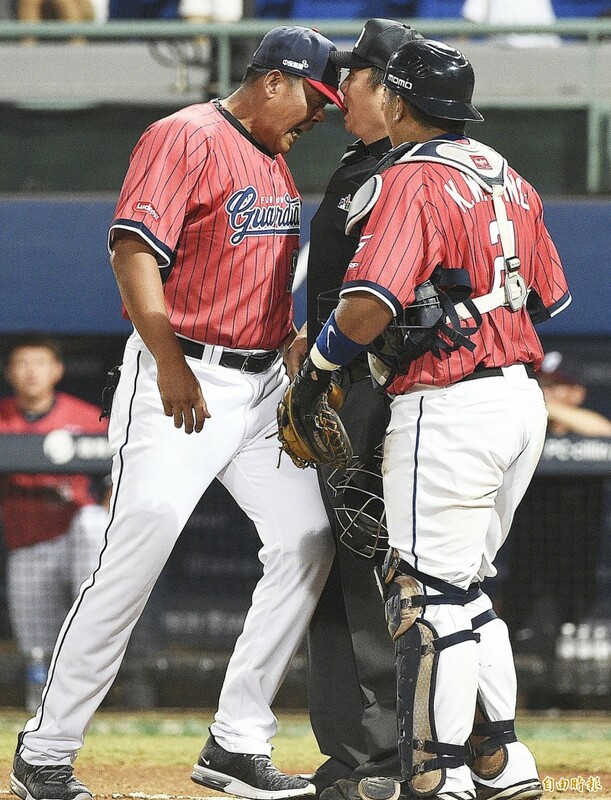 Chen Lien-Hung started his “strike zone dispute” with a headbutt, followed by a hefty chest bump that pushed the umpire back. The Guardians’ pitching coach also joined in on the action by covering the home plate with dirt. 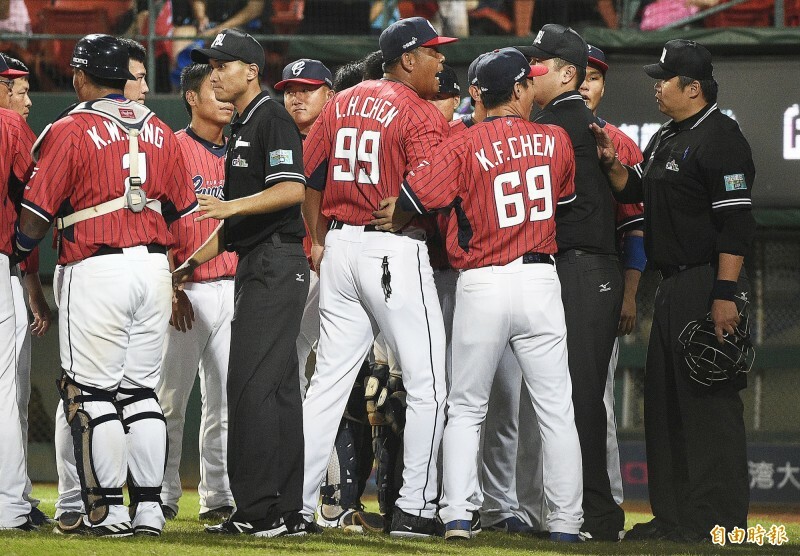 There were a total of three Guardians ejected that night: manager Chen Lien-Hung, pitching coach Kuo Yung-Chih and reliever Kuo Hong-Chih. A great photo from Liberty Sports, giving more of a funny angle to this headbutting incident. A three-game suspension isn’t enough. 30 days would be more appropriate. You can’t allow players or managers to physically assault the umpire. They should update the rule in my opinion. Physical assault punishment is not harsh enough. Like you can swear, kick dirt or bump belly. but head butting? That’s assault..